Situations leading to heat stroke. PONS left out doors in hot and humid weather with no shade or water (applies to dog shows and other events). Exercising your PONS in hot humid weather even if you have water available is putting your PON at risk. Agility events may be high risk. 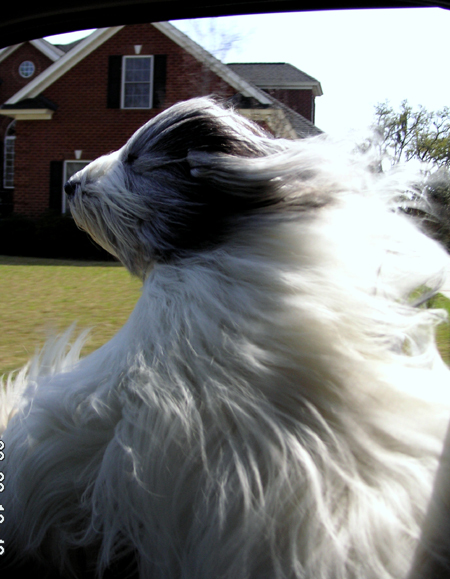 Leaving your PON in a closed car in direct sun or on a warm day even with cracked open windows can be deadly. Panting a normal physiological means to cool off actually saturates the air with water vapour making the air in the car warmer and consequently even more difficult for an animal to cool down. Young and older PONS are more sensitive to high temperatures because they cannot acclimatize effectively. Heavy coated PONS are at higher risk. PONS with medical problems such as history of seizures , heart or lung disease should never be exposed to hot humid temperatures. The objective here is to cool your PON down as fast as possible to bring the body temperature down back to normal . If your PON is outdoors or in a car get your PON out of the car or out of direct heat and bring to a cool shaded area. Hose down your PON with cool water. Use and find anything you can to wet your PON's coat. If you have air conditioning in the car place your PON in car with air conditioning on high and drive straight to your veterinarian. If your PON is in shock and requires CPR have an other person give first aid keep air conditioning on while driving to the veterinarian. Once you have started cooling your PON take it’s temperature every 5 minutes until you reach your veterinarian.When your PON's temperature returns to normal (38.5-39.5degrees Celsius ) stop cooling .